In Home Viewings - "Priest"
After generations of battles between mankind and vampires, the humans introduce a new weapon into war: a group of super warriors called priests. Their skills allow for the defeat of the vampires, the remainder of which are placed on reservations in the desolate land that has become the earth. Some years later, vampires begin ransacking desert settlements and take captive the niece of one of the best priests (Paul Bettany). Against the wishes of the church/government, Priest sets out to track down his niece with the aid of a local sheriff (Cam Gigandet). What he finds, however, could signify the end of mankind altogether. Here's a sample of a conversation I had with a buddy of mine concerning "Priest." Me: "So I watched "Priest" last night." Buddy: "I've been seeing commercials for that. What's that about?" Me: "It's a post-apocalyptic deal. Vampires but not "Twilight" vampires, like big monstery vampires." Buddy: "Oh, cool. Who's in that?" Buddy: "Wait, are you sure you're not talking about "Legion?" Me: "No, I think "Legion" was about angels, not vampires." Buddy: "Oh, right. So...basically, "Legion" but with vampires instead of angels?" Beyond the vampire-angel conundrum, the only difference between "Priest" and "Legion" is that I actually finished watching "Priest" whereas "Legion" now resides on the very short list of movies I sought out (theater, rental, DVR, etc.) and didn't bother finishing. I have a feeling I would consider "Legion" to be one of the worst movies I've ever seen if I'd been able to sit through the whole movie. 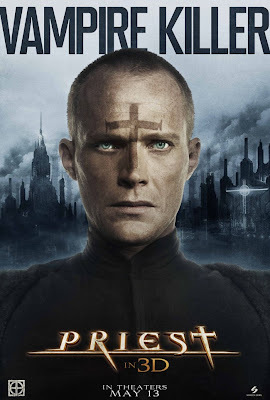 "Priest", meanwhile, is just another pretty awful post-apocalyptic vision of the future that does nothing to distinguish itself from every other post-apocalyptic vision of the future. I keep coming back to this type of movie despite the fact that I know 99 percent of them are horrible and I can't seem to make myself stop. If you've ever seen the intervention episode of "How I Met Your Mother", know that I fully expect my friends and family to hold a similar event for me and ask me to stop post-apocalypting myself. But in the end I'd just reject post-apocalyptic rehab. "I'm not addicted! I can quit when I want!" (he quietly sobs while settling in to watch the newest "Resident Evil" movie). But if I'm in need of an intervention, then what do we need to do for Paul Bettany? He's an incredibly talented and respected actor with some very strong performances on his resume. But almost all of his films are terrible and lately he seems hellbent on running his career into the ground. He's better than "Priest" and he's certainly better than "Legion" but how much longer can we say that he's better than these roles? Two more bad movies? Three? At some point he'll no longer be considered a good actor who chooses roles poorly, he'll just be a bad actor who only does bad movies. This is what happened to Val Kilmer and he's now making straight-to-DVD flicks for $50,000 apiece. Make no mistake: "Priest" is a bad movie. The base concept is somewhat entertaining and I guess the action scenes are decent enough. But everything else about this film is just bad. The acting is bad, the story is porous, and the dialogue is painful. With that said, I can half-way enjoy a bad action movie as long as I'm not distracted by good actors wasting their lives away. If Jason Statham replaced Paul Bettany, I wouldn't bat an eye. This is what Jason Statham is supposed to do: show up in three or four action movies every year, kick some tail, and hope that one of the three or four is pretty good. That's his role in Hollywood and he's incredibly good at it. Bettany, though, is a real actor, not just an action movie guy but he doesn't seem to be aware of this fact. Maybe he just has low self-esteem or perhaps his agent owes a lot of money to the mob and the mob hates Paul Bettany so they keep insisting he show up in movies that make one want to kick a puppy. Either way, this needs to stop before Bettany is forced to appear in "Firewall 2" with Beau Bridges. Everyone else in the cast and crew of "Priest" gets a pass from me except for Gigandet. I don't know how to put this nicely so I'm just going to come out and say it: this guy should never, EVER, be allowed to show up in a major studio release again. In the conversation I noted above, I asked my buddy to think of the worst actor he'd ever seen in a real movie...and then multiply that by five. That's how bad this guy is. I've seen him in another role or two here or there ("Easy A") but he was generally able to blend into the background. This time around, however, he announces his presence to the world in such a way as to make even his mother shudder. His forced delivery of EVERY SINGLE LINE almost caused me to turn "Priest" off in favor of a "Golden Girls" rerun. Do yourself a favor and stay away from "Priest." In fact, for future reference, stay away from all post-apocalyptic films and just come here for the inevitably negative review.